A pancake breakfast was held at Galena High School on Saturday, April 13, raising funds for the “Uniqueness is Beautiful” grant. That grant, started by Galena grad. Kinsey Stephens, helps school districts special education programs purchase needed equipment or to meet other needs. Pictured above, from left to right, are Gary Eikerman, Luanne Eikerman, Joyce Kasten, Carrie Kasten, Gary Kasten, Kinsey Stephens, Kinleigh McFall, Skip Ackfeld, Bentley Smolnik and Peggy Ackfeld. 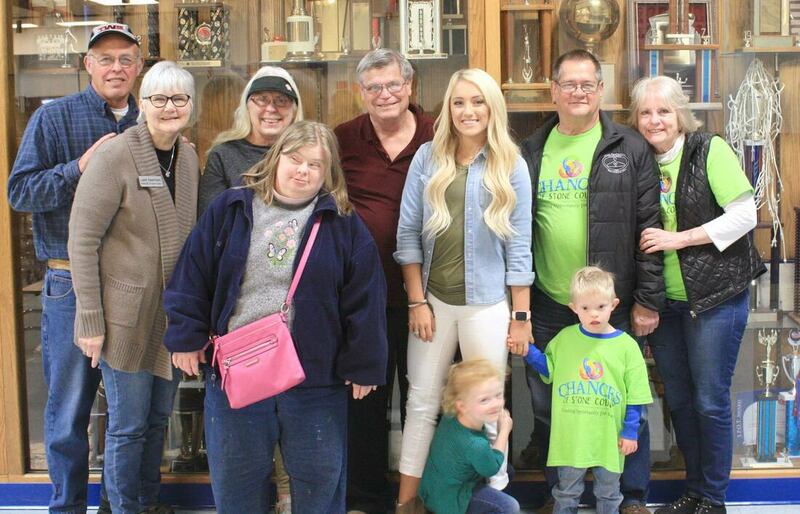 A fundraiser on Saturday, April 13, helped raise money for a grant designed to help special eduction programs purchase equipment. The “Uniqueness is Beautiful” grant was started by Kinsey Stephens, a Galena High School graduate. The event raised $450 for the grant. “The idea came from working the special ed classroom during high school,” Stephens said. “The first year, we sent applications to nine schools. We had $1,000 to give. “Then myself and my partners (students at Missouri State) looked over the applications and determine how to spread the money. We look at whether one school has a much bigger need than the other applicants or if we should distribute it to two or more schools. “I’d really like to expand it throughout the state, especially as I do more with the Miss Missouri competition,” Stephens said. She is the 2019 Miss Phelps County. Stephens is studying nursing at Pittsburg State University in Pittsburg, Kansas.